The Education Department just froze two key protections for students. Before he became president, Donald Trump lent his name to a for-profit fake university that paid $25 million in compensation for abusing its customers. So perhaps we shouldn’t be surprised his administration gives similarly fraudulent operators a pass. That’s exactly what happened on Wednesday, when Betsy DeVos announced a postponement and imminent rewriting of two key rules designed to protect students of predatory for-profit colleges. The Gainful Employment rule and the Borrower Defense rule both force for-profits to make good on their promises of helping students pursue a viable career path, and provide students a way to cancel their debt if the college actually defrauded them. The Gainful Employment rule has already been working to identify what colleges and universities fall short of delivering a quality, useful education; the Borrower Defense rule was set to go into effect July 1. The concept of the Gainful Employment rule is simple: No school that doesn’t prepare its students to succeed should be able to access federal financial-aid dollars. Finalized in 2014, the rule assesses the after-graduation results of career college programs, either from for-profits or certificate programs at public and private universities. If the typical graduate’s loan payment exceeds 20 percent of discretionary income or 8 percent of total earnings, then they did not receive an education setting them up for “gainful employment” under the rule. It also required institutions to publish accurate information about graduation rates, average debt, and expected earnings. If career programs failed the gainful-employment rule, they would be restricted from having their students use federal student loans. The first set of data released under this rule in January, before Trump’s inauguration, found that 800 programs serving hundreds of thousands of students were out of compliance. Approximately 98 percent of those failing programs were from for-profit colleges. Because for-profits survive on federal student loans—which make up almost 90 percent of their revenue—the regulation is an extremely effective way to put unsuccessful or even predatory for-profits out of business. For those cases where fraudulent colleges do abuse students by lying about career-placement rates or earnings and sticking them with useless degrees, the Borrower Defense rule can help these victims get their money back. All student loan contracts have a “defense to repayment” clause allowing students to petition for debt cancellation if their schools close or if they believe themselves to have been defrauded. Before the rise of for-profits, this clause had hardly ever been invoked, but a slew of closures from networks like Corinthian Colleges and ITT Tech led many students to refuse to pay their loans. A long-negotiated process, incorporating the viewpoints of the public and all stakeholders, led to a streamlined rule that allowed groups of defrauded students to get automatic loan discharges instead of having to petition individually. The new rule also expanded the allowable evidence to prove fraud, including job-placement and earnings records and related lawsuits. And it banned forced-arbitration agreements that prevented students from suing their colleges. Saying that “my first priority is to protect students,” DeVos froze the impending rule, calling it a “muddled process that’s unfair to students and schools.” The Education Department cited active litigation in California challenging the rule as the reason to postpone it, but The New York Times obtained draft memos showing that officials initially discussed using budgetary impact as the justification. In other words, they looked for whatever pretense could get them to stop the rule on behalf of for-profit operators. Now stakeholders will have to go through new negotiated rule-making sessions to rewrite the rules, presumably in a manner more favorable to for-profit colleges. 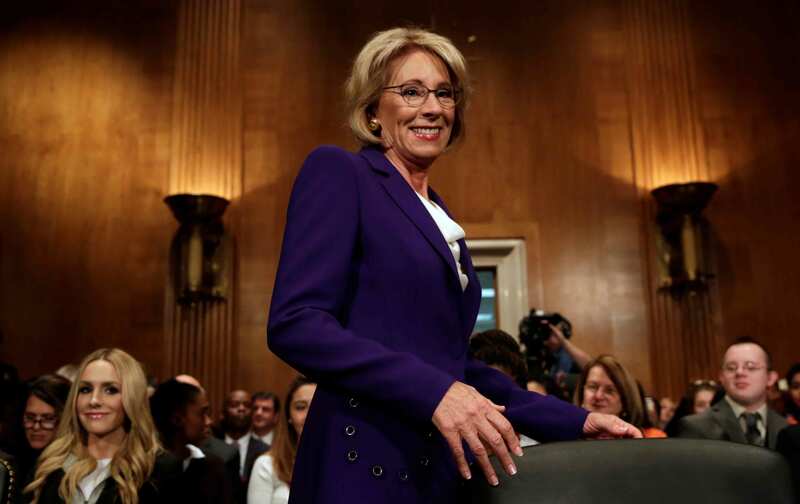 The Gainful Employment rule will remain in effect during this time, and DeVos promised to process approximately 16,000 student applications to cancel their loans under the old Borrower Defense rules. “Some borrowers should expect to obtain discharges within the next several weeks,” DeVos said. However, with the old Borrower Defense rules in place, students are still subject to arbitration clauses that prevent them from taking their colleges to court. And automatic discharges will not go through, forcing students to become private investigators and make highly specific legal formations on the application for individual debt cancellation. This isn’t necessary, as the for-profit colleges involved have already been repeatedly cited, with a mountain of evidence and court rulings, as fraudulent actors. Plus, current and former Education Department officials have acknowledged that for-profits are getting a light touch under DeVos’s tenure. Debt relief has slowed down, joint investigations with state prosecutors have gone cold, and the department has generally gone into a shell on these matters. Indeed, DeVos has brought in former employees of for-profits as top officials at the agency. Veterans groups have been among the loudest complaining about lack of action on fraud prevention. While that gets litigated, public hearings will take place on both rules, on July 10 in Washington and July 12 in Dallas. It’s difficult to find a less deserving recipient of federal largesse than the predatory actors of the for-profit college industry. They use deceptive marketing to prey on single mothers and veterans looking to better themselves, and hand them nothing but worthless degrees and a pile of debt. The Education Department’s decision is just a giveaway to these cheats, consigning more students to pain and suffering. There’s only one saving grace: At least Trump is too busy with the presidency to restart his fake university and join what will now be a land rush to abuse students.